The ceremony is one of the most important parts of your wedding day. Here are 10 secrets to creating perfect photos you will cherish forever. Especially if the aisle is very short, it is crucial that you walk slowly so your wedding photographer can take plenty of pictures of you. Look towards the love of your life and smile. 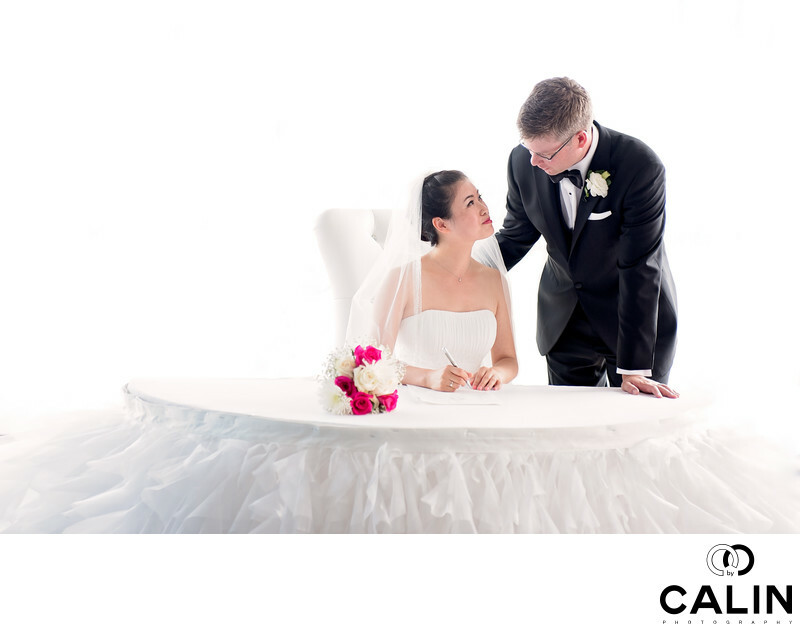 That will give us the perfect moments to capture for your wedding album. Feel free to waive to your friends and family and remember: the more genuine moments you give us, the better the candid photos. Also, if you are getting married in a dark church it is important to walk slowly. Without diving into technical details, in low light situations, you need to walk slowly so that your ceremony images are not blurred. Make sure your bridal party is also aware of this. On your wedding day, I will also remind them to walk slowly. However, out of excitement, often bridesmaids rush to the altar and forget my advice. I typically arrange the bride's dress at the beginning of the ceremony so it looks good in the pictures. Still, depending on the church rules, your professional photographer might not be allowed to come close to you. Ask your maid of honour to keep an eye on your dress so it looks good, especially if you move during the ceremony. 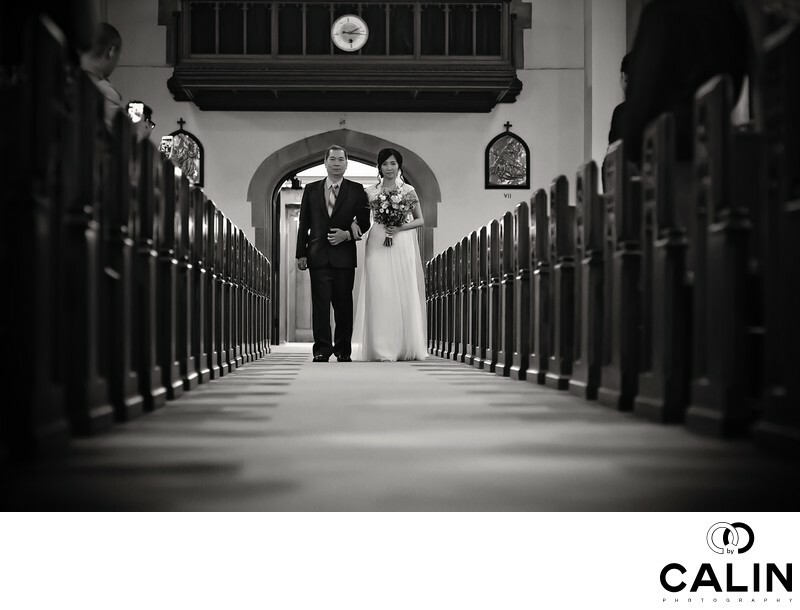 For example, in Catholic wedding ceremonies the bride and groom sit, stand and kneel. Every time, your maid of honour should rearrange your dress. This one is easy. Make sure your first kiss lasts at least three seconds or more so your wedding photographers have enough time to create a variety of images. I always recommend my couples to take a few moments once in a while to just enjoy their special event. When you sign the marriage documents, don't rush! Take your time and look into each other's eyes. You will live that moment more intensely. Also, your wedding photographers will take beautiful images of you. Many of my couples choose to have unplugged wedding ceremonies where they ask their guests to just enjoy the ceremony without taking pictures. Here's the way this works: at the beginning of the ceremony, before the bridal party walks down the aisle, the officiant kindly asks the guests to refrain from taking pictures. Alternatively, you might want to consider an unplugged processional (the part where you walk down the aisle). There are a few reasons why unplugged ceremonies are popular these days. First, your guests will pay attention to you instead of posting on Instagram their last shot. Second, your wedding photographer will take pictures of your guests' faces as opposed to their cell phones and tablets. Finally, the guests rarely share any images with the bride and groom. I promise you: 30 years down the road you will want to see your friends and families genuine emotions, not a bunch of cell phones covering their faces. 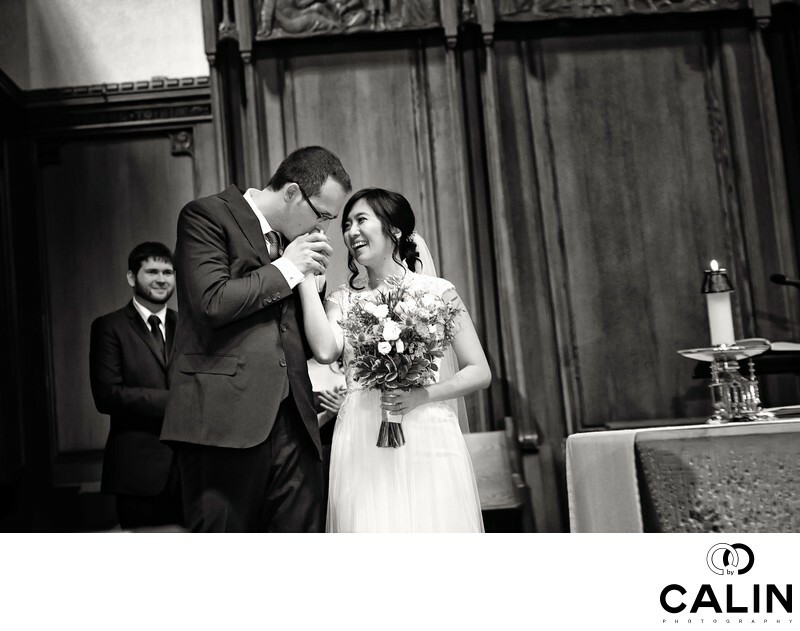 Often, on the spur of the moment, the groom covers the bride's hand when putting on her wedding band. You know something? This is normal. However, if you make sure we can see the rings on your hands, we will be able to take pictures of them during the ring exchange. After all, this is a decisive moment we want to capture. Still, if you forget, we could also reenact the moment immediately after the ceremony. Immediately after the wedding ceremony, your friends and family will come to share their happiness for you and to take pictures. Budget at least 20 minutes for this and NO, there is no way around it. 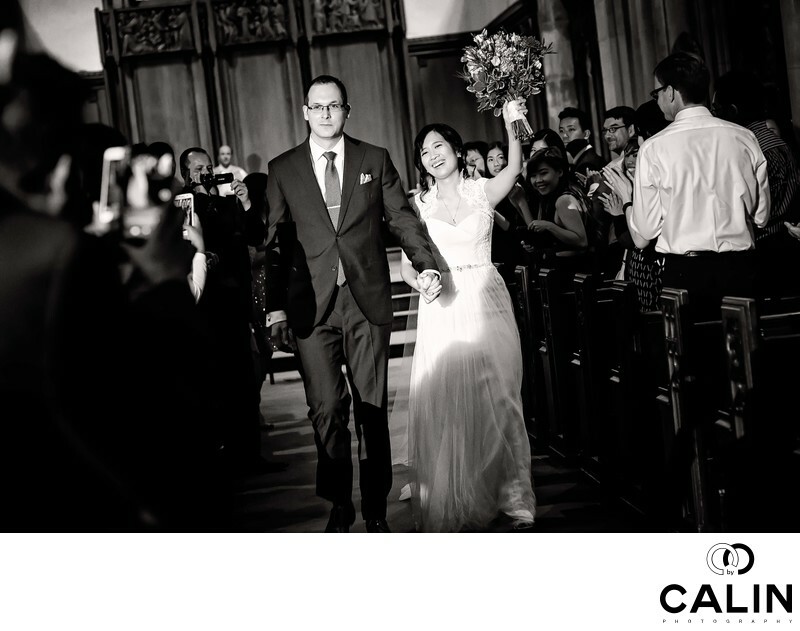 The recessional (the part when you leave after the ceremony) is when the stress is gone, the joy takes over and everybody is looking forward to the party. Here is the bottom line. Walk slowly, smile at your guests and your fiancée, pump your fist or bouquet in the air, give the victory sign and kiss if you want. That will give your professional photographer the opportunities to take plenty of candid shots. Typically, the bride stands to the left of the groom as you look towards the couple. However, sometimes, that is not the most flattering position for the bride. For example, if your hair covers one side of your face, you want to stand so that your face is visible. 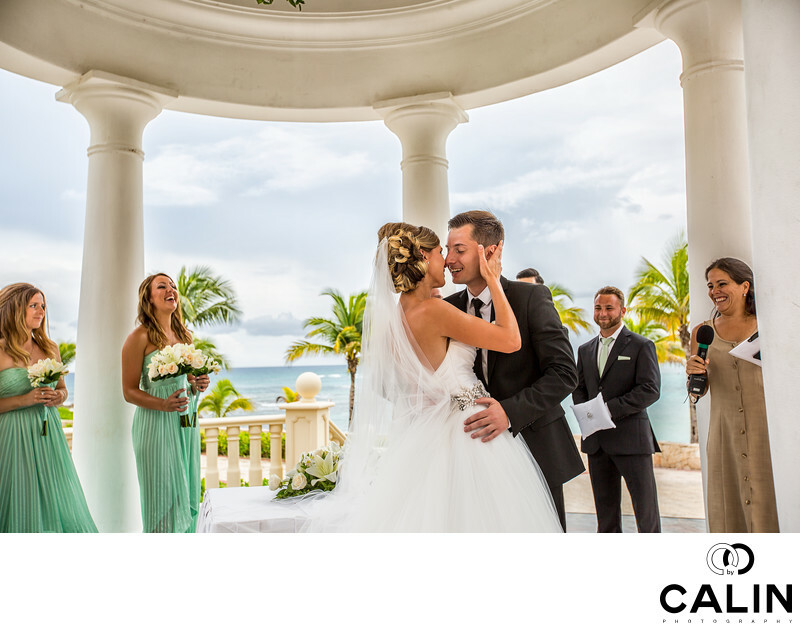 If you plan a destination wedding, just before your special day, take your photographers to the wedding venue or the spot where you will tie the knot. Ask them where you should stand for perfect wedding photos. For outdoor photos, lighting dictates the best position of the couple. What's the bottom line? Once you decide on your hairstyle, before your big day, inform the priest or the officiant where you would like to stand during the ceremony. Many churches, temples, synagogues, etc. have specific rules when it comes to wedding photography. Ask about any restrictions well ahead of your special event. 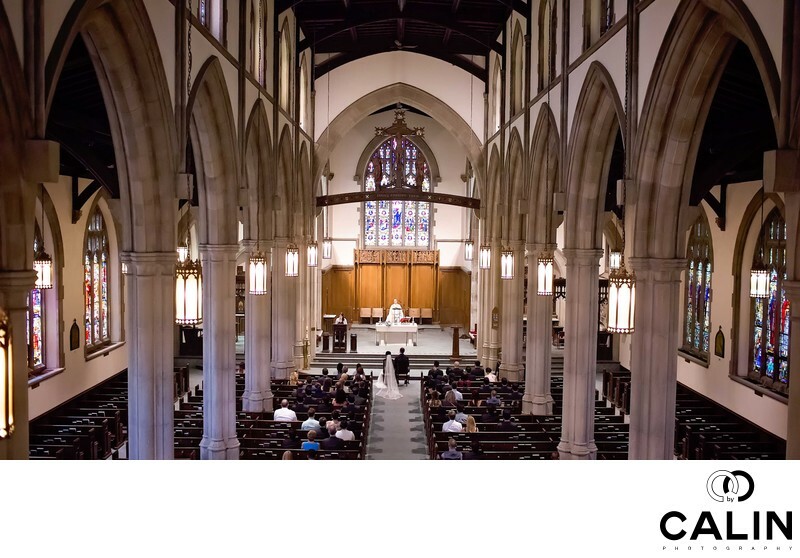 Some Catholic churches don't even allow any wedding photography during the ceremony. In most of the cases, we are asked to photograph from a certain spot, usually at the back of the church, thus missing decisive moments. Here's the deal: find out as soon as possible of any rules and discuss them with your photographer so he is aware and ready on your big day. The above are several simple techniques and secrets that ensure your wedding photos look stunning! Add them to your wedding photography checklist. As a personal rule, I always visit the wedding venue with my clients before their big day to discuss all of the above and much more. Make sure you discuss them with your professional photographer during your engagement session or during your consultation.